On the event pack, in addition to my "extra" O'Brien, I got the begold below. I can freezer someone to make room or I can add a star to dancing Uhura. Looking for some group think on best choices? Easy choice here in Uhura IMO. Uhura has dual 1k bases and starts getting useful at 3/5 with some event potential. High cmd for a Dip crew. 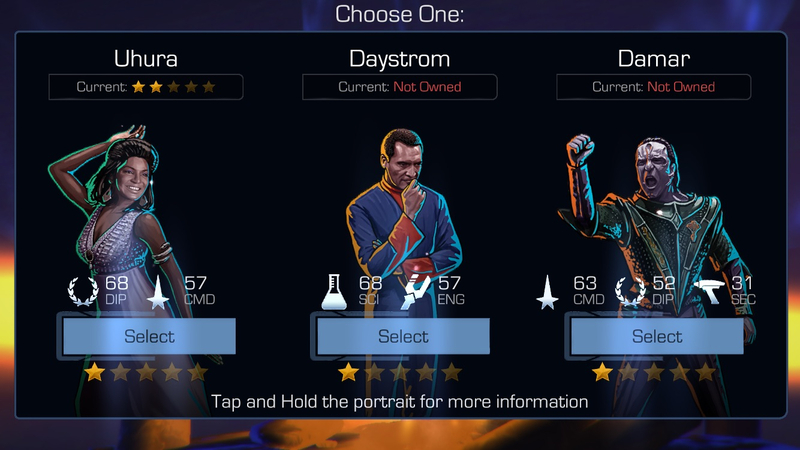 Daystrom has an ok SCI/ENG combo but is outclassed by Caretaker which you'll probably eventually have if you play Gauntlet with the recent increased drop rates, and has zero event potential. Damar is basically a budget Kahless (who you'll lose to every time) in gauntlet and useful for nothing else except maybe a cardassian mega one day. I would add a star, too. You can basically never go wrong by adding a star. That being said, if you’re light on COM gauntleteers, Damar is a great choice. At least until the trait selection rework with 7.0.10, Cardassian and Cultural Figure came up reasonably often...Damar at 25% or even 45% is a tough customer. Daystrom gets trait bonuses less frequently and is indeed behind The Caretaker and even Seven of Nine for overall gauntlet usefulness these days (again, assuming the new trait selection system doesn’t upend things). There is also an away mission node in Episode 9 that he can clear, but he really needs to be at 2/5* or 3/5* to do it and there are others who can do it that may be easier to get. I'd probably add a star to Uhura as well, although I do like having gauntlet options, that's a good begold congrats. Unless you’re in desperate need of a heavy in Science or Command for the Gauntlet, go with another star in Uhura. Thanks everybody - I went with the additional star (which was my first instinct).